Dog trainer Nick White, owner of Off-Leash K9 Training in Woodbridge, Va. was invited to train with Nat Geo Wild's new reality show "Alpha Dogs" next month. WASHINGTON – Nick White has been a Marine, Secret Service member, dog trainer, and now, he can add reality TV show star to his resume. White, owner of Off-Leash K9 Training in Woodbridge, Va. was invited to train with Nat Geo Wild’s new reality show “Alpha Dogs” next month. Each episode follows Kenny Licklider and his team of tattooed, baseball cap and muscle shirt- wearing dog trainers of Vohne Liche Kennels, located on 350 acres in Denver, Ind., as they work tirelessly to produce highly-skilled military dogs. The methods they use to train the dogs, as well as the handlers, aren’t always traditional, but you wouldn’t expect anything else from this unusual team. “I truly look forward to working with these top-notch protection and detection trainers, and I’m confident that I can learn a lot from their vast experience in these areas,” White says. 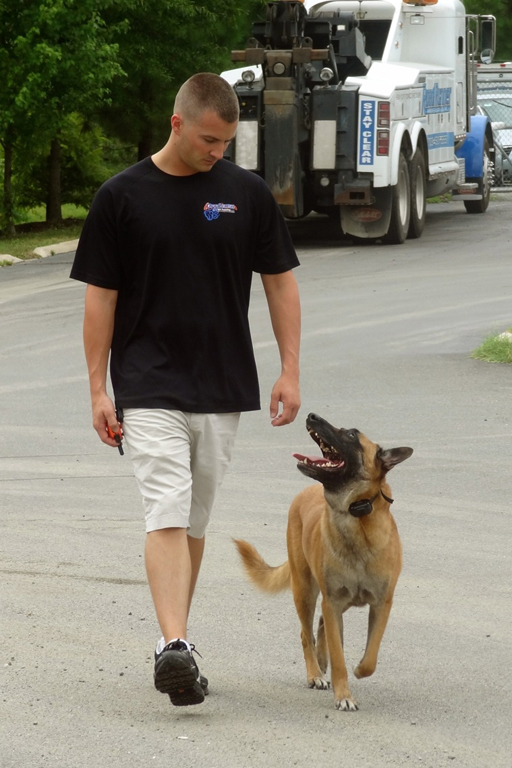 Licklider works with more than 400 dogs and 150 military, police and special forces handlers from 46 states and 20 countries every year. White says his clients differ from Vohne Liche Kennels, since he works with average pet owners as opposed to police military and security contractors. The dogs also have distinct differences. White grew up in a small town in Ohio as the son of a police officer. He trained his first dog as a teenager when his parents gave in to his requests and got him a high-energy German Shepherd who required extensive attention and training. After joining the Marines at age 18, White served in Fallujah, Iraq and worked alongside some of the finest protection dogs in the service. He then moved to the D.C. area to work for the Secret Service. After moving to D.C., a few friends started asking him to train their dogs, and word quickly spread. Eventually, White left the Secret Service in 2009 to begin Off-Leash K9 Training. However, he didn’t anticipate the national attention he would gain. In April 2012, he was featured in a Yahoo! article, which then led to stories in American Legion Magazine and U.S. Veterans Magazine, just to name a few. And then the celebrities came calling. White has trained dogs owned by basketball superstars, music legends and Ultimate Fighting Championship and Mixed Martial Arts fighters. He says each sought him out for his ability to train a “regular dog” to obey with the precision of a working dog, all while building the confidence of the pet, rather than breaking it down. With eight dog training locations around the country, White isn’t lacking in ambition. “Five years from now, I see Off-Leash K9 Training as a household name nationwide, with over 20 plus locations, a hit reality show and even doing product licensing with our name,” he says. White adds that he hopes to learn new training techniques while visiting the “Alpha Dogs” team. dogs Entertainment News katy nelson Latest News Local News marines military national geographic Prince William County, VA News reality tv secret service training centers TV News Virginia woodbridge, va.